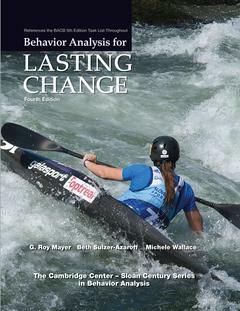 Sloan Publishing is proud to announce the publication of Behavior Analysis for Lasting Change, Fourth Edition by G. Roy Mayer, Beth Sulzer-Azaroff, and Michele Wallace. This comprehensive introduction to the field of behavior analysis has been completely updated and references thousands of scientifically-supported constructive solutions within hundreds of areas of human performance. · Written by a team of authors who are experienced, accomplished, and well-respected as scientists, scholars, consultants and teachers in the ABA field.